충남 홍성군에 있는 성으로, 길이 약 1,772m의 성벽 중 약 800m의 돌로 쌓은 성벽의 일부분이 남아있다. 처음 지어진 연대는 확실히 알 수 없으며, 『세종실록지리지』에 홍주성의 둘레와 여름과 겨울에도 마르지 않는 샘이 하나 있다는 기록만 있을 뿐이다. 왜구의 침입이 예상되는 고을의 읍성을 새로운 격식에 맞추어 쌓게 되었던 조선 세종 때에 처음 쌓기 시작하여 문종 1년(1451)에 새로 고쳐 쌓았다. 당시 성의 규모는 둘레가 4,856척(약 1.5㎞), 높이는 11척(약 3.3m)이며 문은 4개가 있었고, 여장·적대 등의 여러 시설이 설치되었으며 안에는 우물 2개가 있었다고 한다. 동문인 조양문은 현재까지 남아있고 1975년 복원한 것이다. 아문은 조양문의 문루를 설치할 때 함께 세운 것이며 ‘홍주아문’이란 글씨는 흥선대원군이 직접 썼으나 현재 남아있지 않다. 우리나라 아문 중에서 가장 크고 특이한 형태를 지니며 조선시대 관아의 구조와 형태를 살필 수 있는 자료가 된다. 1905년 을사조약 체결에 반대하여 의병을 일으킨 민종식 등이 이 성에 주둔하고 있던 일본군을 공격하여 덕산으로 격퇴시킨 일이 있다. 2012년에 남문인 홍화문을 복원하였다. 이 곳은 삼국시대부터 조선시대에 이르기까지 읍성으로 이어졌으며, 조선 초기 새로운 형식에 의해 쌓은 성이 남아있다는 점에서 가치가 있다. Originally, the length of this stone wall was almost 1,772 meters, but nowadays only about 800 metres remain. 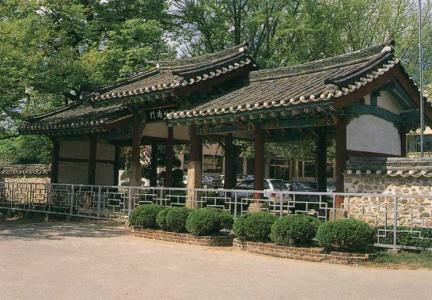 There are insufficient records telling when the earliest construction period was, but a note in Sejongsillok jiriji (Geography of the Annals of King Sejong) tells two facts, one is the circumference, and the other, that there was a spring inside the fortress that never dried through all four seasons. 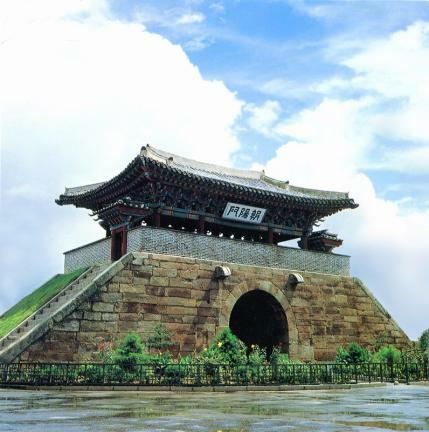 It is said to have been built first in the reign of King Sejong the Great of the Joseon Dynasty as part of his national defense policy. 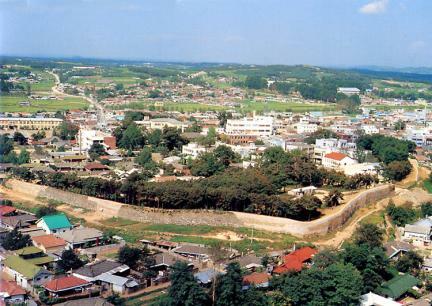 Fortress construction using advanced building technologies protected villages against attack from Waegu, the Japanese raiders. 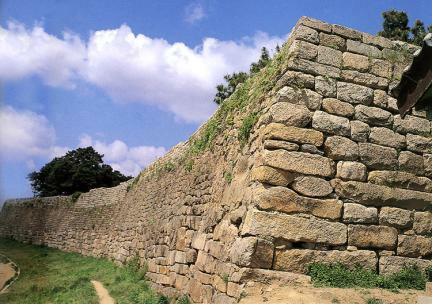 This wall was repaired and reconstructed in 1451, the 1st year of the reign of King Munjong, the 5th King of Joseon. It was said that at that time to be about 1.5km in circumference and 3.3m in height with four gates, various defense facilities and two wells. 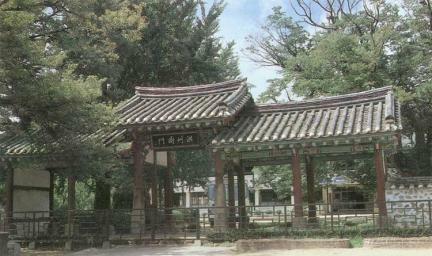 The remaining eastern gate called Joyangmun was restored to its original condition in 1975. 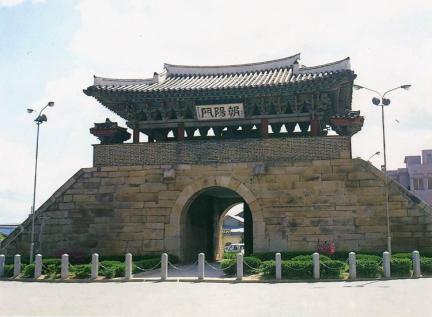 One of the gates, Amun, was built at the time of construction of the upper story of Joyangmun Gate, and the letters "Hongjuamun" were carved on a signboard, in calligraphy by Heungseon Daewongun but it does not remain now. This is the largest among Amun, traditional entrance gates into public building and has a unique form. Furthermore it is regarded as important evidence in researching structures and layouts of public buildings in the Joseon Dynasty.